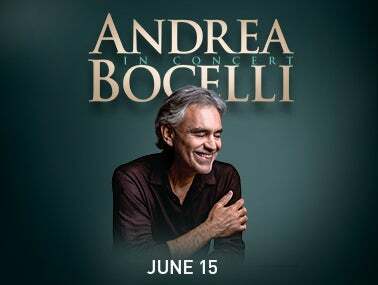 Each performance will feature a unique repertoire from Bocelli’s landmark release “Si,” his first ever chart-topping album on the Billboard 200 chart. The world-renowned tenor will also treat audiences to his beloved traditional selection of arias, love songs and crossover hits. The Sacramento Philharmonic & Opera and the Colorado Symphony will be joining Andrea at their respective dates and longtime conductor, Eugene Kohn, will accompany Andrea for each stop on the tour. As the official credit card of the tour, Citi® cardmembers will have access to purchase exclusive pre-sale tickets and VIP packages beginning on Monday, December 3 at 10 a.m. local time followed by Fan Club beginning on Wednesday, December 5 at 10 a.m. local time. The pre-sale tickets will be available on Citi PrivatePass. For complete Citi PrivatePass details, please visit CitiPrivatePass.com. General ticket on-sale will begin on Monday, December 10 at 10 a.m. For tickets, visit Golden1Center.com. About Citi® Private Pass® Citi offers Citi credit and debit cardmembers access to tickets to thousands of live events annually through Citi Private Pass, the bank's entertainment access program. In 2014, Citi offered cardmembers more than 6,000 music events and worked with more than 1,400 artists ranging from preferred tickets and early access to concert tickets, to curated special events and VIP experiences. Citi has also partnered with Live Nation and Yahoo to present Yahoo Live, which offers fans live online concerts. For more information, visit www.citiprivatepass.com or @citiprivatepass on Twitter.